Apr 19, 2000 - We thank Mike Keane, Yoram Weiss and Ken Wolpin for dicussions ...... using smooth maximum likelihood (SML) (McFadden(1989) and. of Sweden's labor market, such as high minimum wages, a relatively small pool of low-skilled jobs, and stringent employment protection for permanent work. 22, Switzerland, or by email: [email protected] The ILO ... and the International Labour Office called âThe Labor Market Integration of New ...... who come based on family ties, in comparison to natives and labor migrants from EU countries. Non- ..
Jan 4, 2018 - Relationships between highly skilled golfers' clubhead velocity and force ... amount of time engaging in strength and conditioning inter-. social and labour promotion (Domingo and Houle, 2004). In brief, we ..... A combination of both indicators is the ratio ânational population aged 20-29 to 55-64 in. participation of immigrants in the Dutch political system, and consequently also .... offspring), 180,000 people from Surinam (a former Netherlands territory at the. The international mobility of the highly skilled and development: a comparison of China and India. Xiang Biao. Centre on Migration, Policy and Society. that the sources of formal and informal support used by SA immigrants con- .... Community Services Society (PICS) in Surrey and MOSAIC in Vancouver. The. ly life reproduction, such as international schools, expatriate associations and .... 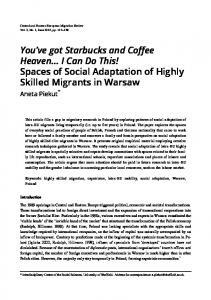 However, the study in Prague focused on a wider, urban area as place and. Introduction In a globalised world with an increasing division of labour, the competition for highly skilled individuals – regardless of their origin – is growing, as is the value of such individuals for national economies. Yet the majority of studies analysing the economic integration of immigrants shows that those who are highly skilled also have substantial hurdles to overcome: their employment rates and salaries are lower and they face a higher education-to-occupation mismatch compared to highly skilled natives. While the literature on immigrants’ labour-market integration in Sweden has focused on explanations of the differences in employment and income by country of origin or entry route to the country, there is a paucity of studies on the employment patterns of highly skilled immigrants to Sweden. The majority of those that exist are policy papers that analyse the effect of changes in Swedish legislation concerning highly skilled immigration (see, for example, Cerna 2009; Emilsson 2014a; Ostling 2013). As an exception, Osanami Törngren and Holbrow (2016) complement their comparative policy analysis of Sweden and Japan with a qualitative study that analyses the employment experiences of highly skilled labour migrants in the two countries. They conclude that there is a gap in each country’s intention to attract highly skilled migrants which they explain by self-reported difficulties experienced by the interviewees in both Sweden and Japan, such as the slow or stagnant career mobility, language barriers, prejudice and difficulties in social integration. This paper fills this gap in the literature by providing an overview of highly skilled immigrants’ labour-market integration in Sweden. We use register data to describe the labour-market participation – by entry route, place of birth and citizenship – of highly educated men and women. We also look at the quality of their employment, as measured by income and occupational skill level. Immigrants with lower education and natives classified by educational level are included in the analysis as comparison groups. Highly skilled immigrants can be defined in different ways. Based on Iredale’s (2001) work, we describe them as those with university education. While Iredale’s definition also includes immigrants with extensive professional experience, due to data limitation this paper focuses on highly educated immigrants whose professional experience before migration is unknown. Therefore, in this paper, the concepts of ‘highly skilled’ and ‘highly educated’ are used interchangeably. The rest of this paper is organised as follows: next we review the literature on immigrants’ participation in host labour markets. In the third section we present the main socio-demographic characteristics of highly educated immigrants to Sweden. This is followed by an overview of the employment rates of the highly educated by citizenship, entry route, major origin country and year of migration. In the fourth section we show the quality of employment, as explained by relative income and occupational skill level, for highly educated immigrants in combination with other key variables such as entry route and year of migration. The last section concludes. as they do for natives. His results are applicable to immigrants with different educational levels, including the highly skilled. frequent among foreign-born individuals than among those born in Sweden (SCB 2006). Unfortunately, we do not have the means to assess the veracity of foreign credentials. However, we trust in the honesty of the majority of the people and therefore, we do not expect the real numbers to be significantly different. labour migrants are over-represented, whereas refugees are slightly underrepresented among highly skilled immigrants. By place of birth, highly educated immigrants from five world regions – the Middle East, EU countries (excluding Denmark and Finland), Nordic countries, the rest of Europe and Asia – represent over 80 per cent of all highly skilled immigrants living in Sweden. Immigrants from EU countries have a higher representation among this group than among immigrants with lower education, while the opposite is true for those coming from the rest of Europe. Highly educated immigrants’ access to employment: who gets in? Figure 1 shows the employment rates of immigrants and natives by level of education and in line with the theoretical proposition of human-capital theory: the higher the educational level, the greater the likelihood of employment for both immigrants and natives. However, this proposition only applies if we look at these two groups separately: not only is the relative number of highly educated employed natives higher than that of their immigrant counterparts but the employment rate is also slightly higher among native men with the lowest level of education than among highly educated immigrants. A similar gender gap is visible in Figure 1 for immigrants and natives, where the gap decreases (and almost disappears) with higher education. According to the literature (see, for example, Helgertz et al. 2014), naturalised immigrants have better labour-market outcomes than those with foreign citizenship. Our descriptive statistics on the employment rates of immigrants by education and citizenship, as reported in Figure 2, confirm these findings for immigrants with all three educational levels.5 The gap is slightly wider among men, while the gender gap is the greatest for both citizen and non-citizen immigrants with primary education. Studies on immigrants’ labour-market integration also show that labour migrants have better employment opportunities and outcomes than refugees and family migrants (Bevelander 2011). Table 1 shows and confirms this pattern. Whereas employment rates are the highest among the highly educated for the three immigrant categories, the employment gap among them is similar for immigrants with secondary and university studies, and higher for immigrants with lower education. The gender gap decreases with higher education for the three groups analyzed. Sweden for at least five years, they would all have had the opportunity to become Swedish citizens if they had wanted to do so. employed in Sweden and that the employment gap is smaller for international adoptees with similar appearance to natives (Rooth 2002). According to this study, these differences can not be attributed to a difference in characteristics observed by the researcher based on register data. While making robust conclusions on the extistence of discriminatory practices based on these factors is, indeed, difficult when using administrative colour-blind data, the results presented in Table 2 also point in that direction for immigrants – incuding highly educated immigrants - living and working in Sweden. Time of residency in the host country constitutes another key factor in the labour-market integration of immigrants. Most immigrants not only need to learn the language of the host country but also lack the other host countryspecific human and social capital that would facilitate their access to employment. Table 3 reports the employment rates of immigrants by educational level and year of migration – starting from 1997 – in 2011. We decided to include those who had arrived five years prior to the year of analysis because we were able to classify them by year of arrival and hence they will not blur the overall picture. This period (2007–2011) is highlighted in Table 3. As shown in the table, nearly half of the immigrants with secondary and university studies who arrived in 2007 were employed five years later, whereas this number was even lower (about 30 per cent) for those with primary education. In Figure 3 we show employment rates by year of migration and gender only for highly educated immigrants. The positive curvilinear correlation between number of years in Sweden and employment, as well as the equalising effect of time in the initial employment gap between men over women mentioned above, become clearer in the graph which, furthermore, shows that getting into the Swedish labour market as a newly arrived immigrant is also challenging for the highly educated. In sum, the employment rates of highly educated immigrants to Sweden are higher than those of immigrants with lower education but lower than those for natives. This is still the case for highly educated immigrants who, in 2011, had been living in Sweden for over ten years. The number of employed individuals is greater among highly educated Swedish citizens and labour migrants than among non-citizens and other immigrant categories. The gender gap in employment decreases with higher education and even reverses for university graduates coming from other Nordic countries, among whom more women than men are employed in relative terms. Female immigrants from Nordic countries and male immigrants from non-Nordic EU and other European countries show the highest employment rates, whereas African and Middle Eastern immigrants, regardless of gender, have the lowest. Based on the International Standard Classification of Occupations (ISCO) we grouped professions in three groups: those for which Skill Level 1 is required were recoded as low-skilled occupations; professions requiring Skill Levels 2 and 3 were classified as middle-skilled, whereas jobs associated with Skill Level 4 – including the first group of managers, etc. as defined by ISCO – were defined as highly skilled. For more information on ISCO, see: http://www.ilo.org/public/english/bureau/stat/isco/press1.htm 7 Note that, in order to make the samples more comparable and exclude individuals who did not have steady employment, we only selected individuals whose yearly income before taxes was equal to or higher than the so called (‘prisbasbelopp’) for 2011, which was set at 42,800 SEK (see Bratsberg et al. 2006). This figure is a yearly approximation amount calculated by Statistics Sweden for calculating both social benefits and admissions. internal differences in income among the foreign-born by year of migration (Figure 5) and the occupational level of highly educated immigrants versus that of natives (Figure 6). study and those who may be participating in introduction programmes in the first two years after arrival. Interestingly, the income gap between newly arrived highly educated immigrants who moved to Sweden in 2007 and those who arrived in 2011 is higher than the income gap between highly educated immigrants who moved in 2006 and those who did so before 1997, both for men and women. This is also the case for immigrants with lower education, with the exception of women with secondary schooling. Based on the results reported thus far in this section, we have stated that the return on education may be less for immigrants living and working in Sweden than it is for natives. The usual arguments found in the literature to explain such disparity could also be applied to this study, namely differences in language skills and other country-specific human and social capital between immigrants and natives, and discrimination towards the foreign-born (see, for example, Bevelander 2000; Behtoui 2007; Carlsson and Rooth 2007). Finally, the reasons for migration, the route of entry into the host country and the consequences of all these also influence the employment opportunities for immigrants (Bevelander and Pendakur 2014). We conclude our analysis on the quality of employment of highly educated immigrants by looking at the skill level of their jobs by entry route, i.e. for labour migrants, family migrants and refugees. As expected, the proportion of people working in highly skilled jobs is greater among labour migrants than among family and asylum migrants, while there are more family and asylum migrants working in middle-skilled jobs than there are labour migrants. Figure 7 shows the data for men and women. It is clear from the graph that the percentage of highly skilled family migrants and refugees working in highly skilled occupations is greater among women than among men. There are also slightly fewer female family migrants and refugees but more labour migrants employed in elementary occupations, compared to men. furthermore, (ii) the employment rates of highly skilled immigrants who have been living in Sweden for ten years or more are lower than those of lesseducated natives. These findings do not support economic assimilation theory, according to which immigrants’ earnings tend to converge with those of natives as they accumulate country-specific human capital over time (see, for example, Chiswick 1978). The main limitation of this exploratory study is the cross-sectional use of register data. As pointed out by Borjas (1985), cross-sectional data are not as suitable as longitudinal data in the study of immigrants’ labour-market integration over time. Instead, he suggests selecting different cohorts - that is, immigrants arrived in different time periods - and following them over time. This strategy allows the comparison of the labour market integration of immigrant cohorts with potentially different characteristics in terms of education, entry route and countries of origin. Furthermore, it also facilitates the assessment of the effect of the economic cycle on the labour market outcomes of different cohorts. However, the purpose of this paper was to give an overview – which was missing from the literature – of the labour-market situation of highly skilled immigrants in Sweden, rather than conducting more complex analyses of immigrant integration over time. Longitudinal cohort and qualitative studies are needed to get a deeper understanding and explanation of the role of social capital and discrimination in the Swedish labour market for highly educated immigrants. References Aydemir, A. (2011) ‘Immigrant selection and short-term labor market outcomes by visa category’, Journal of Population Economics, 24(2): 451–475. Arai, M. and Skogman Thoursie, P. (2009) ‘Renouncing personal names: an empirical examination of surname change and earnings’, Journal of Labor Economics, 27(1): 127–147. Becker, G.S. (1972) ‘Human capital and the economy’, Proceedings of the American Philosophical Society, 136(1): 85–92. Becker, G. (1975) ‘Human Capital: A Theoretical and Empirical Analysis, with Special Reference to Education’, Second Edition. National Bureau of Economic Research, Inc. Available at: http://EconPapers.repec.org/RePEc:nbr:nberbk:beck75-1. Behtoui, A. (2007) ‘The distribution and return on social capital: evidence from Sweden’, European Societies, 9(3): 383–407. Behtoui, A. (2008) ‘Informal recruitment methods and disadvantages of immigrants in the Swedish labour market’, Journal of Ethnic and Migration Studies, 34(3): 411–430. Bevelander, P. (2000) Immigrant Employment Integration and Structural Change in Sweden, 1970–1995. Södertälje: Almqvist and Wiksell International, Lund Studies in Economic History 15. Bevelander, P. (2011) ‘The employment integration of resettled refugees, asylum claimants, and family reunion migrants in Sweden’, Refugee Survey Quarterly, 30(1): 22–43. Bevelander, P. (2016) Integrating Refugees into Labour Markets. Bonn: IZA World of Labour series. Bevelander, P. and Pendakur, R. (2014) ‘The labour market integration of refugee and family reunion immigrants: a comparison of outcomes in Canada and Sweden’, Journal of Ethnic and Migration Studies, 40(5): 689–709. Bratsberg, B., Raaum, O. and Røed, K. (2006) ‘The Rise and Fall of Immigrant Employment: A Lifecycle Study of Labor Migrants to Norway’. Available at: https://www.frisch.uio.no/publikasjoner/pdf/riseandfall.pdf Bratsberg, B., Raaum, O. and Røed, K. (2014) ‘Immigrants, labour market performance and social insurance’, Economic Journal, 124: F644–F683. Borjas, G.J. (1985) ‘Assimilation, changes in cohort quality, and the earnings of immigrants’, Journal of Labor Economics, 3(4): 463–489. Borjas, G.J. (1993) ‘The economics of immigration’, Journal of Economic Literature, 32(4): 1667–1717. Carlsson, M. and Rooth, D. (2007) ‘Evidence of ethnic discrimination in the Swedish labour market using experimental data’, Labour Economics, 14(4): 716–729. Cerna, L. (2009) Changes in Swedish Labour Immigration Policy: A Slight Revolution? SULCIS Working Paper 2009:10 ISSN 1654-1189. Available at: http://www.spl.su.se/polopoly_fs/1.55488.1321514490!/SULCISWP2009_10.pdf. Chiswick, B.R. (1978) ‘The effects of Americanization on the earnings of foreign-born men’, Journal of Political Economy, 86(5): 897–921. Chiswick, B.R. 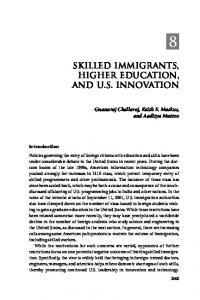 (2000) ‘Are immigrants favorably self-selected? An economic analysis’. In Brettell, C. and J. F. Hollifield (eds.) Migration theory: Talking across disciplines. New York: Routledge, pp. 61–76. Chiswick, B., Liang Lee, Y. and Miller, P.W. 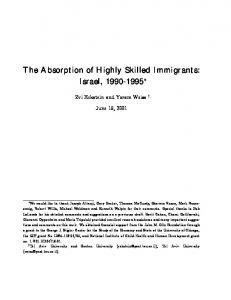 (2005) ‘A longitudinal analysis of immigrant occupational mobility: a test of the immigrant assimilation hypothesis’, International Migration Review, 39(2): 332–353. Dahlstedt, I. (2011) ‘Occupational Match. Over and Under-education of immigrants in the Swedish Labour Market’, Journal of International Migration and Integration 12(3): 349-367. Dahlstedt, I. and Bevelander, P. (2010) ‘General versus vocational education and employment integration of immigrants in Sweden’, Journal of Immigrant and Refugee Studies, 8(2): 158–192. Emilsson, H. (2014a) Labour Migration in a Time of Crisis. Results of the New Demand-Driven Labour Migration System in Sweden. Malmö: Malmö University, MIM Working Paper Series 14:1. Available at: http://dspace.mah.se/bitstream/handle/2043/17882/WPS%2014.1%20Henrik%20 Emilsson.pdf;jsessionid=C5B4EF0E24B6D22559B680B79C8A7374?sequence=2. Emilsson, H. (2014b) No Quick Fix: Policies to Support the Labor Market Integration of New Arrivals in Sweden. Washington, DC and Geneva: Migration Policy Institute and International Labor Office. Eriksson, S. (2010) ‘Utrikes födda på den svenska arbetsmarknaden’, in Vägen till Arbete: Arbetsmarknadspolitik, Utbildning och Arbetsmarknadsintegration. Stockholm: Fritzes, 243–389. Bilaga 4 till Långtidsutredningen 2011, SOU 2010:88. Helgertz, J., Bevelander, P. and Teganumataki, A. (2014) ‘Naturalization and earnings: a Denmark–Sweden comparison’, European Journal of Population, 30(3): 337–359. Iredale, R. (2001) ‘The migration of professionals: theories and typologies’, International Migration, 39(5): 7–26. Lemaître, G. (2007) The Integration of Immigrants into the Labour Market: The Case of Sweden. OECD Social, Employment and Migration Working Papers No. 48. Available at: http://www.oecd.org/sweden/38164205.pdf Osanami Törngren, S. and Holbrow, H.J. (2016) ‘Comparing the experiences of highly skilled labor migrants in Sweden and Japan: barriers and doors to long-term settlement’, International Journal of Japanese Sociology, DOI: 10.1111/ijjs.12054 2016. Ostling, A. (2013) An Overview of Highly Skilled Labour Migration in Sweden with a Special Focus on Indian Nationals. CARIM-India Research Report 2013/35. Available at: http://www.india-eu-migration.eu/media/CARIM-IndiaHSM-2013-35.pdf. Rooth, D.O. (2002) ‘Adopted children in the labour market: discrimination or unobserved characteristics?’, International Migration, 40(1): 71–98. DOI:10.1111/1468-2435.00186 SCB (2006) ‘Evalvering av utbildningsregistret 2006:4’. Available at: http://www.scb.se/statistik/_publikationer/BE9999_2006A01_BR_BE96ST0604 .pdf. 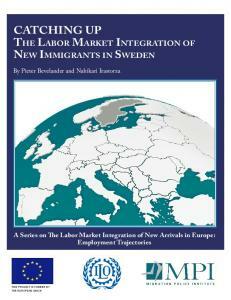 Report "the labour-market participation of highly skilled immigrants in sweden ..."